Dorado, marlin, roosterfish, tuna and yellowfish are among the prime catches along the Mexico’s Sea of Cortez and northwest Pacific coast. BAJA CALIFORNIA — One of the many advantages of living in Southern California is our close proximity to Mexico, where anglers flock to drop lines and interact with one of the most diverse marine life populations in the world. Dorado, marlin, roosterfish, sailfish, tuna, wahoo and yellowtail are among the bites to be had in what Mexico’s tourism folks describe as world’s aquarium. That aquarium would definitely be found in the Sea of Cortez, where the inside of Baja California’s peninsula protects the waterway from rough fishing conditions. Cities like La Paz and Loreto have positioned themselves as ideal destinations for fishing charters and expeditions. Great fishing trips are also to be had at Ensenada and Los Cabos, particularly if you’re looking for Pacific Ocean bites. Here’s a broad look at what you can expect should you have the itch to drop a line or two or more south of the border. Deep sea fishing off the Ensenada coast ranges from winter bottom fishing to summer surface action. Ensenada is also a great jump off point for local island bites – specifically at Los Coronado (or Islas Coronado) – or long-range catches. Recent fish counts out of Sergio Sportfishing in Ensenada show barracuda, rockfish, sand bass and yellowfin tuna as popular bites. Also found on recent fish counts are salmon grouper, rock cod, calico bass and whitefish. Also out of the shores just west of the Guadalupe Valley is Ensenada Sportfishing. Barracuda, bonito, calico bass, Dorado, lingcod, red snapper, rock cod, sheephead, skipjack, whitefish, yellowfin and yellowtail were all caught on recent expeditions out of Ensenada Sportfishing. Dorado, bonito, barracuda, albacore, bass, marlin and tuna (bluefin and yellowfin) are all ideal spring and summer bites, while cod and other deep sea fish are likely to be at the end of your line during the winter months. Nearby Punta Banta is great for deep sea fishing, while some islands in or near Bahia de Todos los Santos have solid bites of cod and mackerel. The southernmost point of the Baja California Peninsula is home to one of the biggest marlin tournaments in the world. Marlin, of course, isn’t the only bite to be had here. Other popular bites are mahi mahi, snapper, tuna and wahoo. A recent fishing report from Picante Sportfishing out of Cabo San Lucas showed anglers catching 35 Dorados, five blue marlin, four striped marlin, four sailfish, four skipjack, three tunas, two wahoo and one shark over an 18-day stretch in late summer. Fly-fishing for billfish is also a thing in Cabo San Lucas. Local charters offer trips just before first light. What makes Cabo San Lucas – and San Jose del Cabo, for that matter – ideal for anglers is its close proximity to different bodies of water. Cabo San Lucas itself touches the Pacific Ocean, making it a great destination for ocean fishing. Yet the mouth of the Sea of Cortez is just past San Jose del Cabo (north by northeast). The Sea of Cortez, as mentioned above, is ideal for calmer fishing conditions. Blue marlin is quite common in Cabo San Lucas, with the species most active between May and November. The leopard group – also known as cabrilla – is also a great catch throughout the year, though the species bites most between April and November. Mahi mahi bites (mostly) coincide with blue marlin, while pargo and roosterfish are common in late spring, summer and early fall. Roosterfish bites are popular for East Cape anglers, particularly near Punta Arena. Most of the offshore fishing in the East Cape takes place within a 25-mile radius from shore. Inshore fishing opportunities are also available. Baja California Sur’s capital city of La Paz is the first major fishing destination for anyone turning into the Sea of Cortez from the Pacific Ocean. The most popular bites in La Paz are Dorado (June through August), striped marlin (May through September), roosterfish (June through September) and yellowfin (July through September). Cabrilla, grouper, Pacific jack cravelle, blue marlin, sailfish and wahoo are also good bites at various portions of the year. The bites to be had in Loreto are the same as they are in La Paz and Los Cabos. 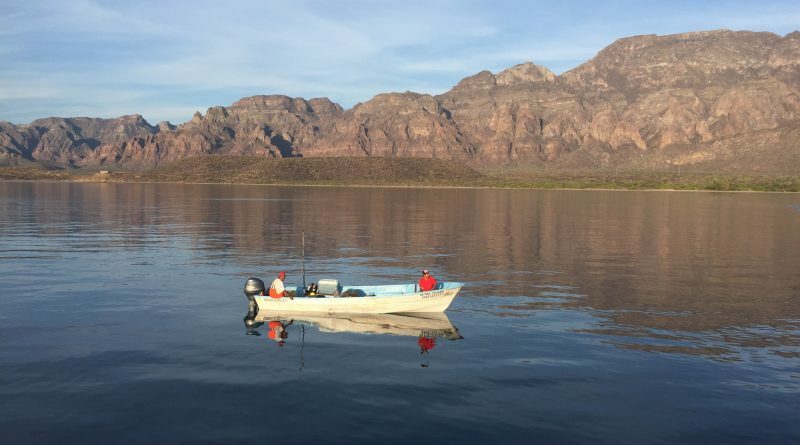 Anglers, however, have the added bonus of calmer waters off Loreto’s shores, as the city is farther up the Sea of Cortez coast (and away from the Pacific Ocean). Amberjack, whitefish, sea bass, pargo, snappers, pinto bass and yellowtail are available year-round here. Seasonal bites include Dorado, marlin, sailfish and roosterfish. Wahoo and yellowfin tuna are also found off Loreto’s waters, from time to time. No one likes paperwork, but paperwork is what you will have to fill out if you want to fish in Mexico. Be sure to get your fishing license, FMM (Forma Migratria Multiple, or Mexican Tourist Permit), TIP (temporary boat importation permit) and insurance.